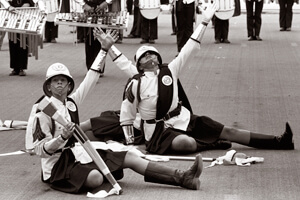 The 1979 DCI World Championships in Birmingham, Ala., was the first time the big show went to America's southern states. It was also the first time that the Finals lineup was comprised entirely of corps that were previous finalists. Blue Devils' score of 93.55, just 0.10 short of a perfect General Effect score, was the highest winning score of DCI's eight-year existence. Of the first four corps to appear in the '79 Finals, the Cavaliers, Blue Stars and North Star all played the theme to Chuck Mangione's "Children of Sanchez." The biggest surprise of the week was undoubtedly the Troopers knocking Crossmen out of Finals by two tenths of a point. To better comprehend this, consider that at the DCI Midwest Championship a month earlier, Troopers placed 16th while Crossmen placed 6th. 27th Lancers' color guard brought down the house with performers spinning rifles on the ground, and Bridgemen had the audience laughing hysterically with a spoof on the television classic "The Gong Show," along with their "Civil War Medley," which witnessed a little historic revisionism about who won the war. The Cavaliers made it back into the Finals after falling out the year before. In the Prelims competition, Phantom Regiment placed just a tenth of a point under the Blue Devils, then slipped 0.80 down in the Finals, finishing 2nd for the third year in a row. The production opened with the finale from Camille Saint-Sa?«ns' 1886 "Symphony No. 3 (Organ Symphony)." Saint-Sa?«ns was a product of the Romantic era in music, but he personally wasn't fond of romanticism. He was even less fond of modernism, walking out of the first concert performance of "The Rite of Spring," offering his opinion that Stravinsky was "mad." Yet, he was not opposed to innovation, in 1908 becoming the first "name" composer to write a soundtrack for a movie. "Symphony No. 3" isn't really a symphony for organ as much as a symphony with organ. Many non-drum corps folk became familiar with the work's final movement when it was used as the theme for the hit movie, "Babe." The volume of Phantom Regiment's brass section "off-the-line" was brutally intense, capturing the effect of being blown out of one's church pew by a great pipe organ. The use and mastery of crescendos by the horns was especially awesome around the two-minute mark. Arranger Jim Wren masterfully had the full line play, and then dropped out the sopranos while low and mid voices began to crescendo. Only when those instruments took the volume as far as it would go, he imperceptibly snuck in the sopranos to add instant "oomph." This is a prime example of why he's a member of the DCI Hall of Fame. The corps' "Malambo" (from "Estancia") introduced South American music to DCI audiences. An estancia is a large cattle ranch on the grassy pampas plains of southeastern South America. Argentinian composer Alberto Ginastera had studied with Aaron Copland and was inspired by Copland's use of national folk melodies and styles. He often worked the inspiration of gauchos (cowboys) into his music. The 1943 "Estancia" ballet suite was lifted from a 1941 ballet about country life in Argentina with the title "Malambo." It's also the title of a dance of the gauchos, moving in a fast 6/8 rhythm to show off their prowess. Check out the athleticism of the color guard rifle section in the accompanying video clip, especially the demands on the strength of the performers' legs in the sudden drops. That helps explain why the guard was often in the running for top honors. The next three works were all by Norwegian composer Edvard Grieg. This section of the show started with the lovely "Morning" from "Peer Gynt Suite No. 1," the first of two orchestral suites extracted from Grieg's music composed in 1876 for "Peer Gynt," a play written by famed playwright Henrik Ibsen. Evocative of the waking hours of the day, with a bird whistle capturing the tweeting of early-rising birds, the piece was truncated as the long crescendoing melodic line swept into the grand hit of the concert standstill that followed. Grieg's "Piano Concerto in A minor" was written in 1868, when he was 24 years old. Inspired by Norwegian folk music, it was the only concerto he wrote for piano and it soon became one of the most popular works for the instrument. In 1909, it became the first piano concerto to be recorded, albeit in a shortened version due to the primitive nature of early recording media. The corps' version was a short jazz-rock version of the famous melody, quickly leading into a rendition of Grieg's "In the Hall of the Mountain King." Grieg's "March of the Dwarfs" is the third of six pieces from "Lyric Suite," an 1891 work arranged from his earlier "Lyric Pieces" for piano. Written after a visit to a Norwegian mountain range, it portrays the mystical and mischievous creatures that in folklore are said to inhabit the range. This served as the production's percussion feature and ended with the color guard's popular "Rockford File" sequential flag and rifle spins and tosses down the 50-yardline. Richard Wagner's "March of the Meistersingers" opened the closer with a dramatic processional, segueing into the composer's "Elsa's Procession to the Cathedral" (from the opera "Lohengrin"). First performed in 1850, this piece prefaced Elsa's marriage to the title character. 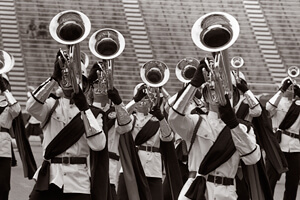 Regiment's version is one of the great slow and steady "builds" in drum corps history, and after an absence of 32 years, was reintroduced to fans in the corps' 2011 production, "Juliet," when it was no less powerful but just as appreciated. It is one of the best demonstrations of the sheer power of a horn line to reach into one's soul, rattle the bones around a bit, and leave one emotionally drained. For this week only, you can save on the Legacy Collection DVD that contains this complete Phantom Regiment performance, along with all finalists from the 1979 DCI World Championships. Discount DVD offer ends Monday, July 8 at 8:30 a.m. ET.